SEO. No, not “see-o.” It stands for Search Engine Optimization, or “how to make it easier for Google to find your stuff.” This tutorial is called SEO for Bloggers because I’m not going to give you an entire SEO class right now–I’m going to tell you how to use Yoast to get a “green light” for your posts and help them get seen by more people. Simple. First step is to install the plugin called WordPress SEO by Yoast. As bloggers, we want people to see our posts – we want Google to see our keywords and add our posts to Google search results pages, right? Google has spiders (also called crawlers or bots) that scour the internet all the time. Every time you post something new, the bots are signaled to go through your site to see what you posted. They look for keywords – words that are found multiple times in that one post. They look in different parts of your post to see if the article you posted is quality content. They think they’ve figured out how to tell that through these key things: using keywords within your text and using enough text (your article can’t be too informative if it’s made up of mostly pictures), the presentation/layout of your post (is it one big paragraph, or do you break it up for ease of reading? ), and links you have within the post (photos or web links). WordPress SEO by Yoast helps give you a visual reminder (red, yellow, and green lights) to add these things to your blog post. Now, I don’t always try to get a “green light” for my posts. My Wordless Wednesday posts, for example, aren’t going to be very searchable. They’re for me and my readers, and I’m ok with that. Your goals for green lights depend on your blog content and your goals. Note: These images are outdated, but due to the nature of the post, with tons of images, I haven’t had time to rewrite it. The information in this post is still good–the images are just a bit outdated, and I think that’s ok for explaining the concept of Yoast. This is where we start. Let’s take this post for example. 1. My keywords are “SEO for bloggers.” I decided on these words because I want people to find this post when they type “SEO for bloggers” into the Google search bar. You can tell Google that those are your keywords by adding them in the “Focus Keyword” box. Adding keywords to this box will do a couple of things. My keyword -or phrase- was found in my article heading (the first paragraph of my post), page title, page URL (permalink), and content, but not my meta description. That’s ok – we’ll get there in a minute. You’re good to just copy and paste here from the “focus keyword” area, but if you want to have the best shot at being SEO friendly, go ahead and take your capital letters out and add dashes for the bots. Not adding dashes is a-ok too. That is your meta-description. It tells people what your post is about. I love that you can decide what gets previewed. If you don’t enter anything in this box, Google will choose some of your first paragraph for you – it may or may not help you get clicks. So frustrating. “SEO For Bloggers” is in my title. I’m letting it go and writing my post. 5. Yay! We have a green light, but looking at the Page Analysis, it could still get a little better. We can make it better by adding “alt” tags and titles to our photos. Interesting note: I had to make the above graphic because when I added those keywords to my post content, my light went from green to yellow. Google doesn’t like “keyword stuffing” or “keyword linking” and you’ll hurt your SEO by doing it. Title, URL, and first paragraph contain the keywords. 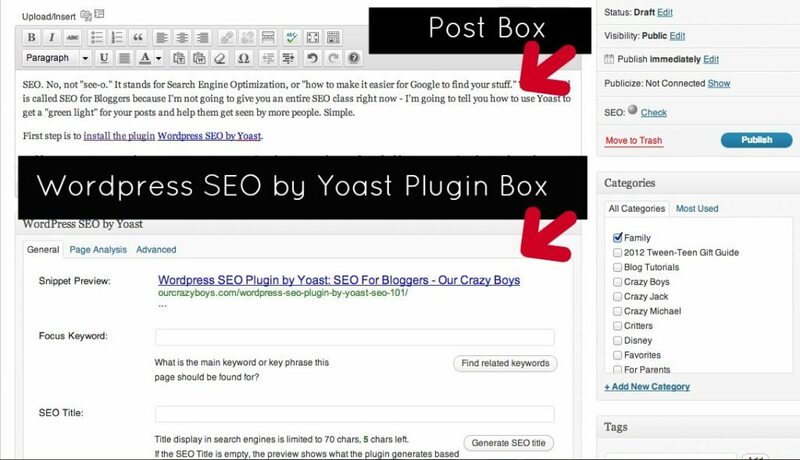 Fill in your Yoast plugin box with your keywords and meta description. Check for (and attempt to fix) red warnings in the Yoast box. Check the “Page Analysis” in the Yoast box and follow through on some of the suggestions. Add “alt tags” and titles (including the keyword) to your photos. 1. Add a few (relevant) outbound links to your post. A list of websites to reference is a great way to do this. 2. Use the keywords in H2 format to break up your post. 3. Make sure your post has at least 300 words. Mahalo.com has a great post about SEO that includes videos – definitely click over there if you still have questions aout SEO. So, what do you think? Are you ready to improve the SEO for your blog posts? I haven’t tried this before but it looks like a great plugin that could be really helpful. I’ll have to check it out. Thanks, Liz! I’m glad you understand it a little more! Great post, I am muddling my way to green lights a lot but I see some more tips that I can use and explanations on what google “thinks” helps me conceptualize what I am doing! Thanks, Karen! I’m glad it helped! I had heard of Yoast, but never really “got it” until now. Thank you! I’ve been using this for most of the year and I really love it, it’s so easy to use! Isn’t it, Jen? It takes a few minutes to figure it out, but after that, it’s quick! I’ve tried a few SEO plugins for word-press and none of them was good as the Yoast plugin. While Saying that I must note that it has issues – sometimes it says my keywords do not appear in the first paragraph although they appear, or sometimes it keep saying my title is too long, but overall – its great! Finally, a post that explains something technical in a way that I can easily understand. Thank you… awesome job! Yay! That was my goal – thanks for stopping by, Nicolle! Isn’t it funny how happy a little green light can make a girl? Thank you, Sara!! Yes – install it and let me know what you think! Nice article! Validates some of the work I’ve been doing on my own blog. I always go for the green myself, but am pretty new to blogging, though I guess you could say I did blogging before it was a thing about 7 or 8 years ago. Anyway, just wanted to add that if you’ve not given the breadcrumbs feature a try yet that you should. That was one of the pieces of Yoast’s plugin that took me the longest to figure out and setup, but definitely worth it I think. Thank you, Wayne! I haven’t tried that yet – I’m looking into it now, though! WordPress SEO by Yoast is definitely the best SEO plugin out there. But you have to follow some steps to get that green light. Thanks for stopping by, Saqib! I hope people will spend the extra few minutes to try it out! Thanks, Carrie! I love this plugin – it has done amazing things for my posts! This is a great post and you’ve broken down the steps really well, have shared on my social channels! Thank you, Carly! I appreciate that! Great plugin, thanks for the overview. You’re welcome! Thanks for stopping by Andrew! I recently added this plugin. I didn’t know that I could add the SEO title myself. I always click on generate the title. This is one of my favorite plugins. I actually feel like I’m getting SEO, finally. Your description helped me out a lot. Yay!! I’m so glad it helped you! Please let me know if you have any other questions, ConnIe! This was so helpful! I’ve never filled meta description and always wondered how to change the facebook snippet and here is the answer. Btw, a little off-topic from the greenlight – do you know how to set up which image will go to the facebook snippet the same way you write the meta description? Yes, Sonia! You need to set a featured image. In my blog setup, it’s on the right side of the post screen under where you choose your tags and categories. Can you find it in yours? H2 is a second level heading. The H stands for heading. They go down from 1-6. One is reserved for your page’s title/main heading, and is outputted by the template. The others can be added by yourself, throughout your copy in the WordPress edit screen. In this original post, the author could have “chunked” her content into sections using headings. (Think like sub chapters”) So “Meta Description” could have been one heading, for example before she went on to speak about how to optimise the meta description. This helps with both skim reading (so people can quickly find what they’re after quickly) and SEO. It’s a good idea to contain keywords and related phrases in H tags. So, “Optimising your blog’s meta description” would be a good thing for a H2. Diana, H2 format is in a dropdown on the top right of your posting screen. It stands for Heading 2 (there are different level headings). I’m so excited! I just installed it and went through your notes. Thank you so much for taking the time to explain this – it is so very helpful! I’m so excited for you to start using it! You’ll LOVE it! Great, great article about the plugin, and about SEO basics as well. Turns out I’m currently on a site redesign of one of my sites, where I’ll also start blogging on web design. I’ve already installed the plugin, and quite comfortable with it, but this article here just lets me know I made the right choice. I did have in mind to migrate my active blog to this plugin after testing it on this site I’m building. After this article, my mind is probably made up. thus it’s nice to read this blog, and I used to pay a quick visit this web site everyday. or haven’t given themselves permission to get out of their comfort zones. website. It looks like some of the written text within your posts are running off the screen. higher-priced. You will find many different types of hoover with several different attributes. Therefore before buying a top rated vacuum cleaner ensure you understand what sort of vacuum-cleaner is best for your needs. This has been the only article/tutorial so far that I have come across that has been easy to understand! I just changed over to WP and got the plug in and don’t understand half of what I should be doing! You have definitely cleared a few things up for me! should be thinking about eating. But you can’t just stand there grinning like an idiot until they finish laughing. Am I correct to assume that you can only use the SEO if you have a premium WordPress site? Yes, Holly – Plugins are only available for self-hosted sites. You can still write your posts for SEO, though – still following the guidelines above, but there will be no prompting by the Yoast plugin. I definitely recommend writing for SEO, no matter what platform you use. That was a great post, but I’m still on blogger. Any suggestions for something I could use ? Use the web to find Portland roof contractor information and compare rates and services. in tickets for concerts as well as theatre. Metal roofing is not great for climates known for harsh winters. This is the reason you should look for roofing Minneapolis services. down in traffic, not a good sign I take it? I’m not aware of anything similar for Blogger, but that doesn’t mean you can’t still write for SEO. Create a checklist and follow that! Many thanks for the excellent write-up, I was hunting for details similar to this, going to visit the various other articles. Simply wish to say your article is as astounding. The clearness in your post is just cool and i could assume you are an expert on this subject.